Philly BBQ Rock Show Tonight: July 3rd | Schwervon! TUESDAY, JULY 3rd BBQ ROCK SHOW! Philadelphia, PA / Nite starts 8pm! Thank you New York for welcoming us back with open arms. The Brooklyn show on Friday was down right spiritual. Big ups to Berth Control, Supercute, Freddie Fox & Trixie Rose, John S. Hall’s impromptu poems and those super nice fellas at Big Snow. 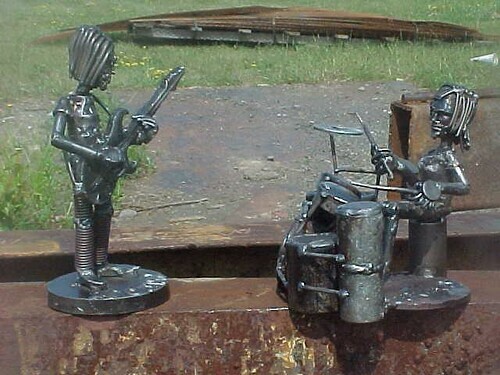 Check out these AMAZING sculptures that our friend Bill gave us at the show!!! The Beacon River Fest show the next day was a pure relaxing delight. Loved the pulled pork tacos and sweet potato pie. We even found a bag of weed in the parking lot which we passed onto our friend Anthony. Score all around! And last but not least the Goodbye Blue Monday solo night was a wonderful homecoming. It was nice to share the stage again with Julie and Gold as well as discovering favorite new local band Heavy Birds. Thanks to Steve and crew at GBM for always being there. 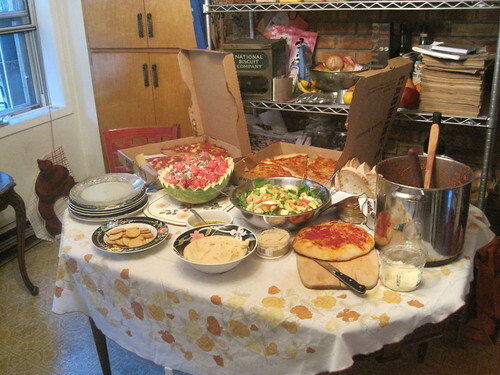 Nice spread at last night’s Humboldt House Party. It was nice to be able to visit our second family in NYC so soon after our relocation. Nan and I miss and love you all so much. We feel truly blessed for having such wonderful friends. Check out more Summer Sun 2012 tour pics here! This entry was posted in Uncategorized and tagged Beacon River Fest, Berth Control, Big Snow Buffalo Lodge, great indoors, NYC, Philadelphia, Schwervon!, Supercute. Bookmark the permalink.